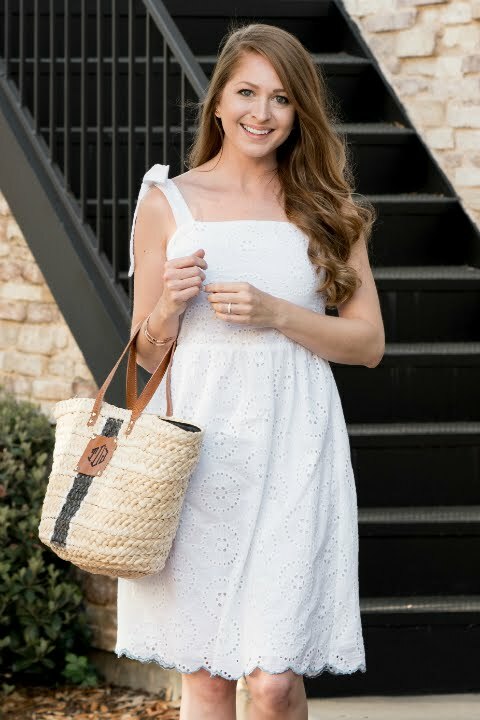 If you looked up the definition for ‘spring sun dress’, a photo of this darling little eyelet dress would have to be right there with it. 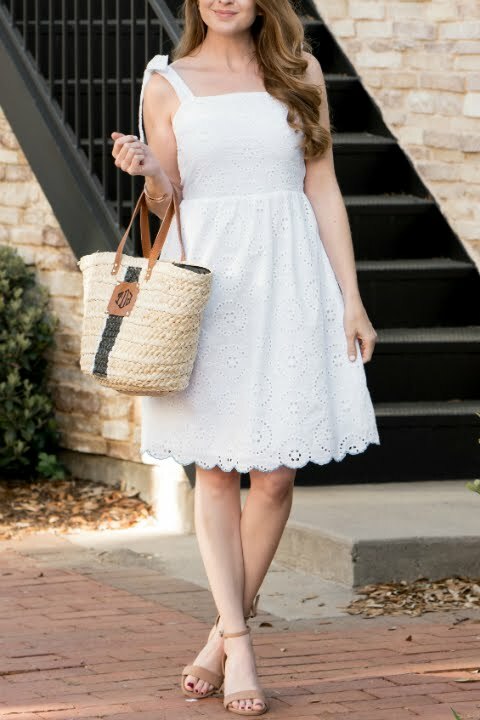 I am obsessed with eyelet details, and there’s just something even more lovely about a crisp white eyelet outfit in the spring. 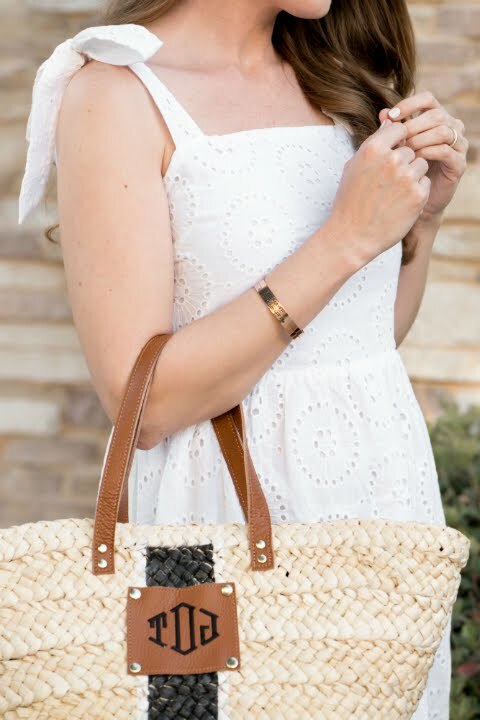 It has the cutest ties on the shoulder and a pretty light blue scalloped hem. I got it from an adorable boutique called Sugarlips, where you can get a 15% discount on your purchase with my code ‘tristan15’. 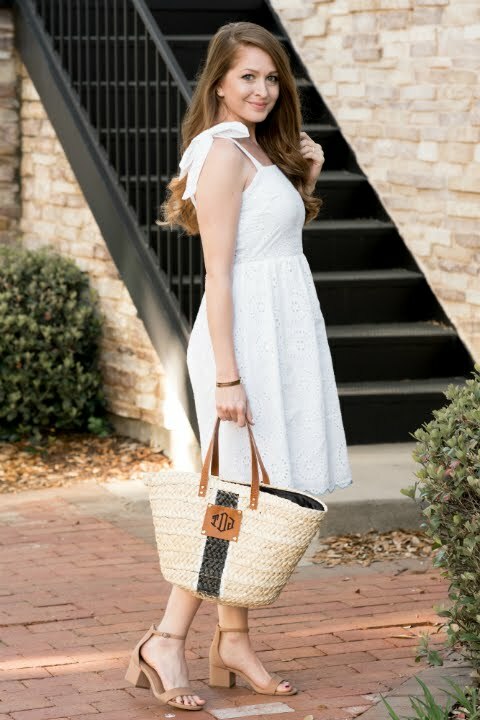 I just love the southern charm that this dress exudes, and it pairs so perfectly with my monogrammed straw tote bag! I have already worn the heck out of this dress. If you follow me on Instagram, you may have seen that I just took a trip to Charlotte, NC with two of my friends (Lacey of The Glitter Gospel and Annie of Absolutely Annie). I wore this ALL DAY during one of the days we were running around town, and somehow it worked for every single place we went. I may have stuck out like a sore thumb among all the green on St. Patrick’s Day, but I felt oh-so lovely and that’s really all that matters! 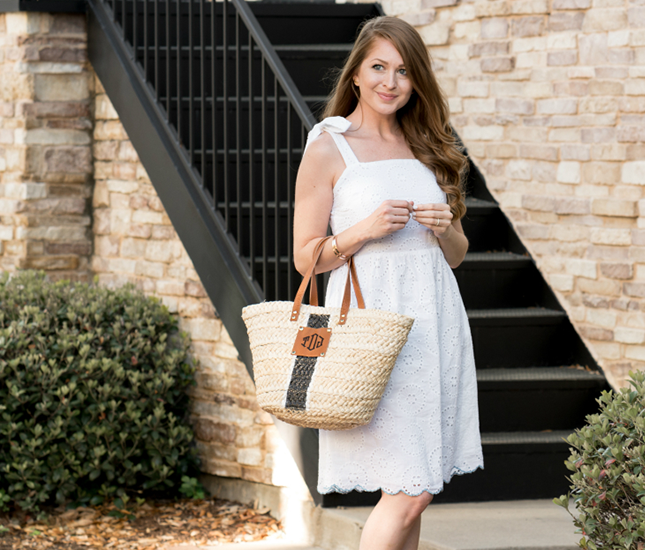 Speaking of our Charlotte trip, I will have a travel guide up on the blog in the next couple of weeks that you will want to keep an eye out for if you are planning a trip to Charlotte. 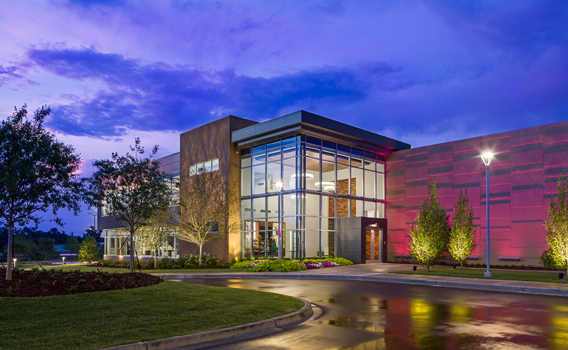 You guys – Charlotte is such a fun city with so much to do and see! I can’t wait to share more about where we went and what we experienced. 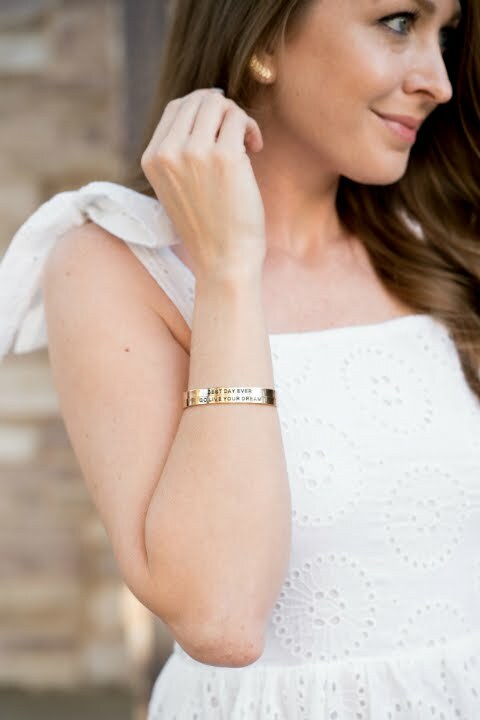 I just posted about these cute Lillian & Co. bracelets on Instagram and everyone seems to love them (including me, obviously)! There are lots of quotes to choose from, but I went with ‘Best Day Ever’ and ‘Go Live Your Dream’ because I think it’s the perfect positive reminder to keep with me throughout the day. 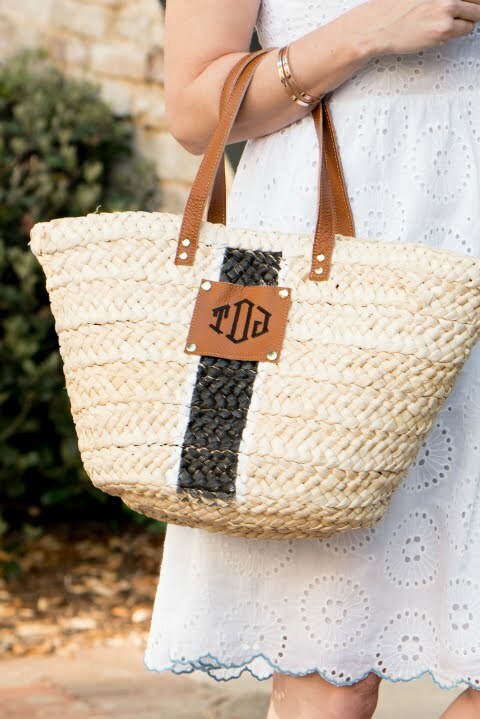 Wouldn’t they make such sweet gifts for friends and family? Use my code ‘THEPOLISHEDPOSY’ for 10% off at Lillian & Co.
5 BuzzFeed Quizzes to Take Right Now!